At Serene Oaks Dental, we strive to stay on top of the latest technologies to better your dental experience with us. 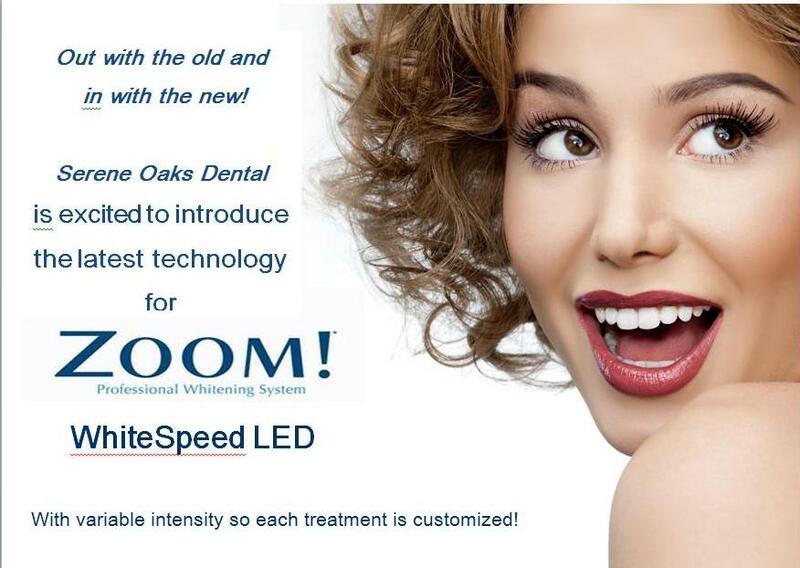 That’s why we are excited to introduce the latest technology for our teeth whitening: Zoom! WhiteSpeed LED. Now, your smile can sparkle for miles with our new teeth whitening technology! Zoom! WhiteSpeed LED is the most advanced LED whitening technology, giving our dentists near Minneapolis the ability to customize your treatment to reach your desired shade. Zoom! WhiteSpeed LED uses the combination of a gel and the LED light to brighten your smile in one office visit. It is an easy process for you, providing dazzling results. With little-to-no discomfort and many amenities to make your appointment relaxing, Zoom! WhiteSpeed LED surely beats over-the-counter products. Schedule your Teeth Whitening Consultation! Isn’t it time your smile truly shines? Our dentists near Minneapolis will work closely with you to make sure you are delighted with your results. Share with us: What’s the number one thing you would change about your smile?